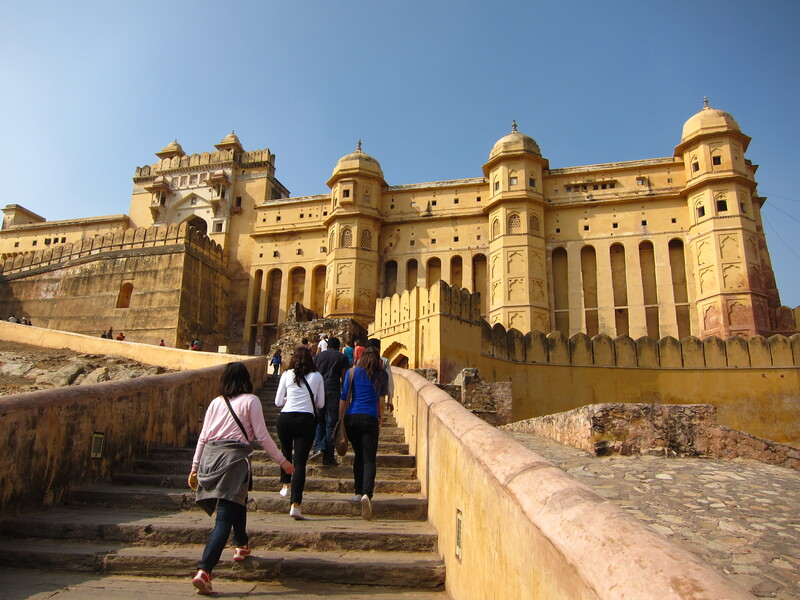 …Our next stop was one of the most beautiful forts in the state of Rajasthan, if not all of India, called Amber Fort (known locally as Amer Fort). 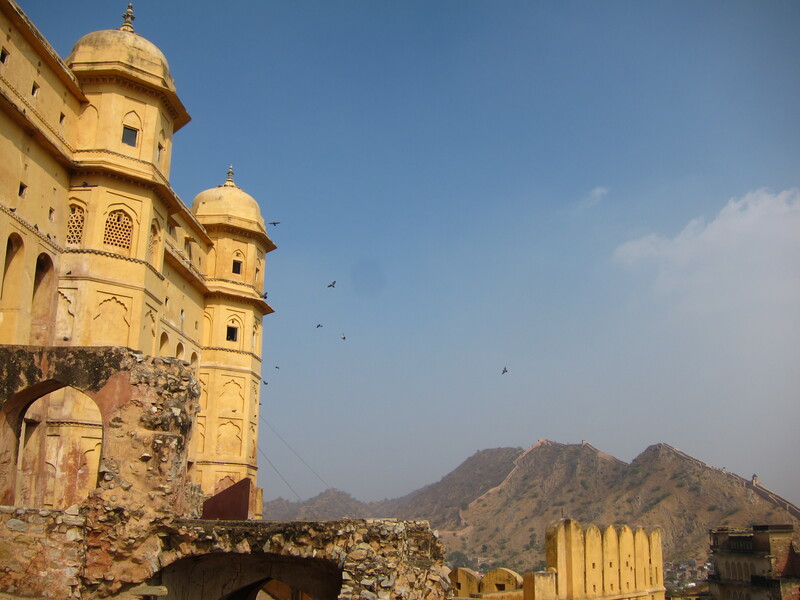 The city of Amer gained prominence as the capital of the Kachhwaha Rajputs, a formidable clan of the ruling warrior class, from 1037 AD to 1727 AD, after which Maharaja Jai Singh II (the man who built Jantar Mantar) moved the capital 11 km southwest to Jaipur. The Kachhwaha clan used marriage as a form of diplomacy, which they seem to have handled very well. 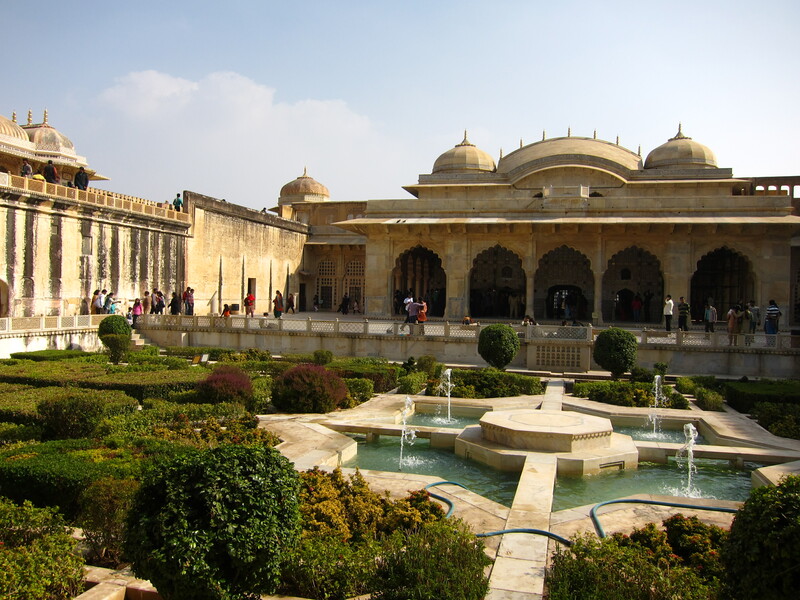 Noticing the rise in wealth and power of the Mughal Emperors in Delhi, Agra, and Fatehpur Sikiri, the Kachhwahas ensured strong ties with the Mughals through marriage and military support. War booty contributed to massive wealth for the local Maharajas (kings). 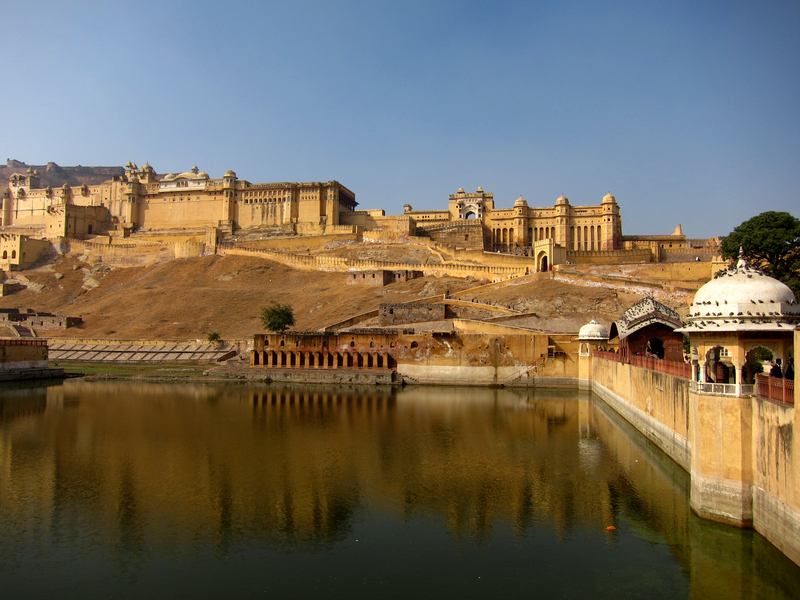 Maharaja Man Singh, the Rajput (warrior ruling class) commander of Mughal Emperor Akbar’s army (remember him from Fatehpur Sikiri and Agra Fort), began construction of Amber Fort in 1592. 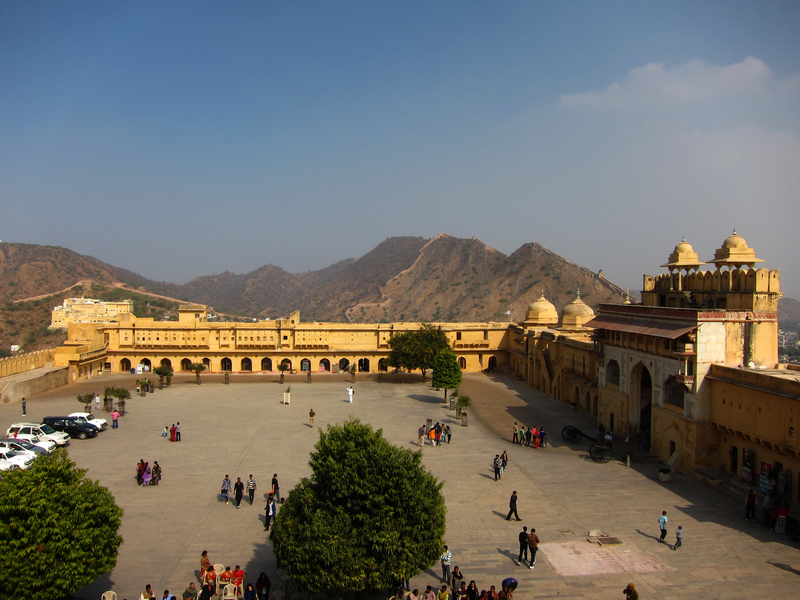 Because the Kachhwahas were strictly Hindu and the Mughals strictly Muslim, the resulting architecture of Amber Fort is a unique blend of both architectural styles. The Maharaja here would have 12 queens and many mistresses. Each queen lived in a separate room around the courtyard shown above. 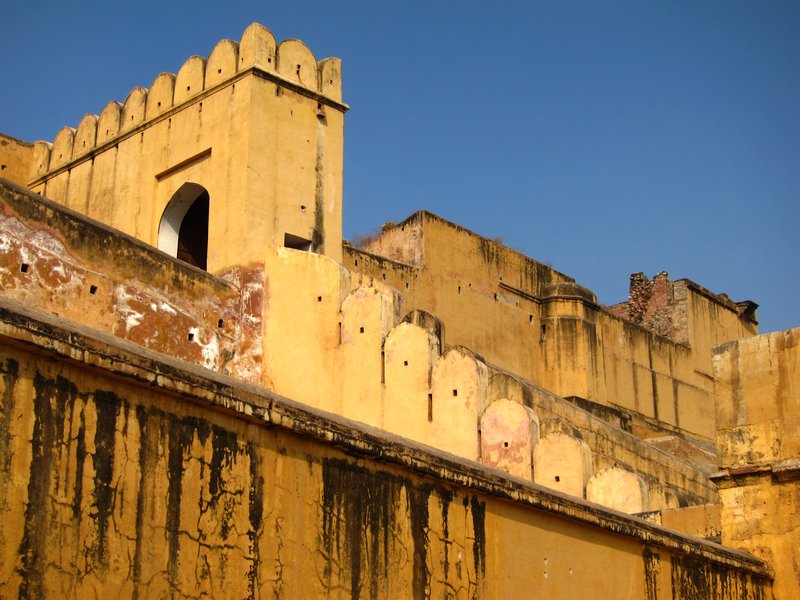 Secret passages in the walls behind allowed the Maharaja to travel freely throughout the palace and into each of the queens’ chambers in secrecy. 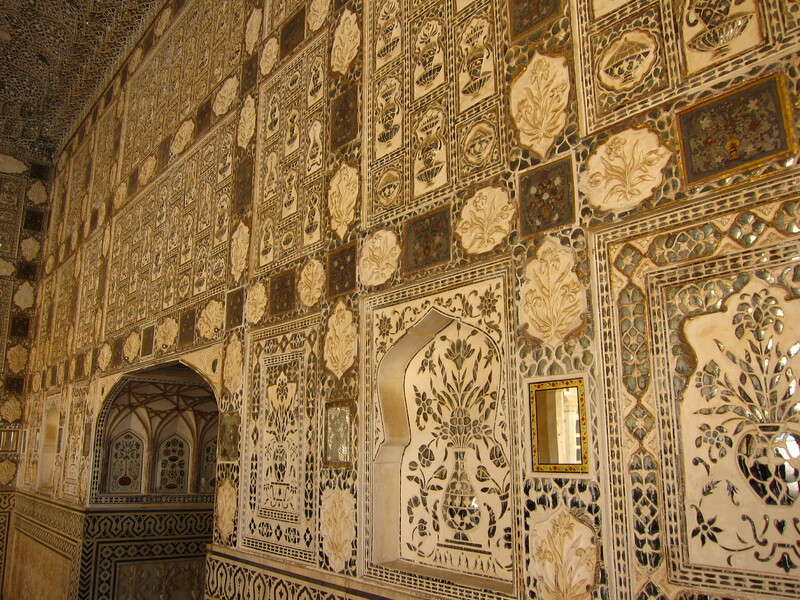 Carvings of Kama Sutra still adorn the molding in some of the queens’ chambers. 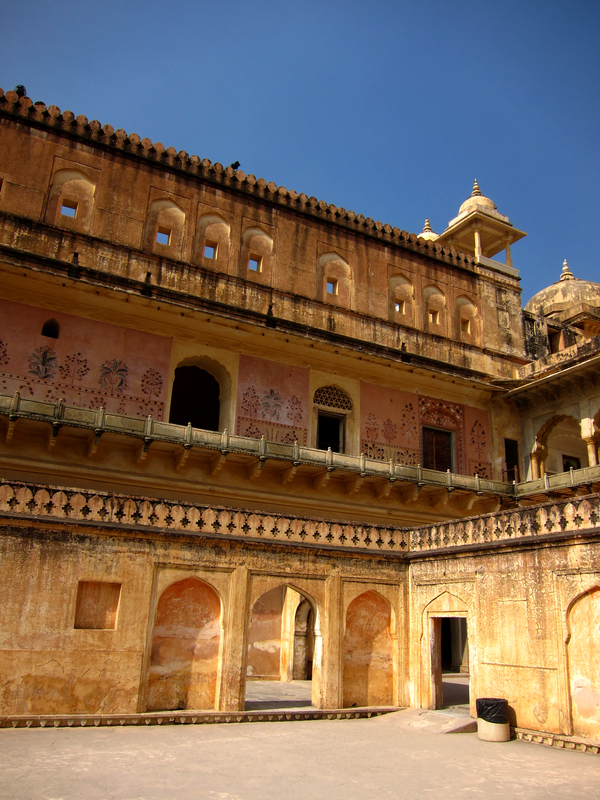 Although the Maharaja likely had dozens of children, only his first son was attributed to him. I believe no invading force ever entered Amer to challenge the Kachhwahas, which was probably a good decision. The town of Amer is surrounded on most sides by steep, rocky mountains. A massive wall that resembles the Great Wall of China runs up and down the ridges of the mountains and is easily visible from miles away. 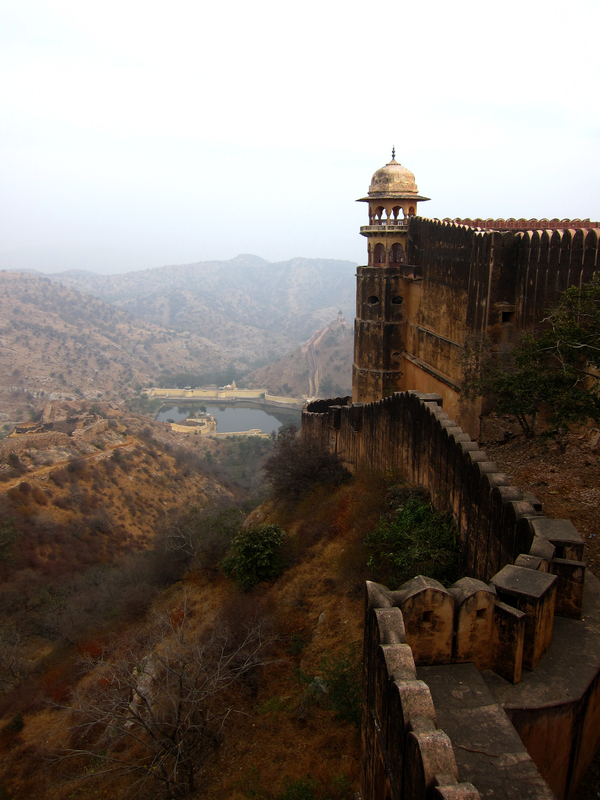 The Amber Fort is halfway up one of the highest mountains and is directly downhill from Jaigarh Fort. 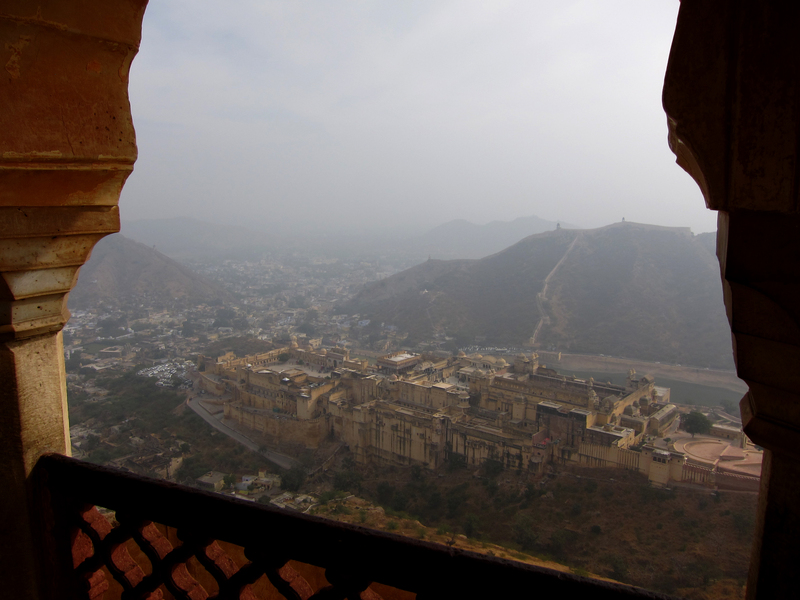 Jaigarh serves as a massive citadel that overlooks and protects the entire town, wall complex, and Amber Fort below. 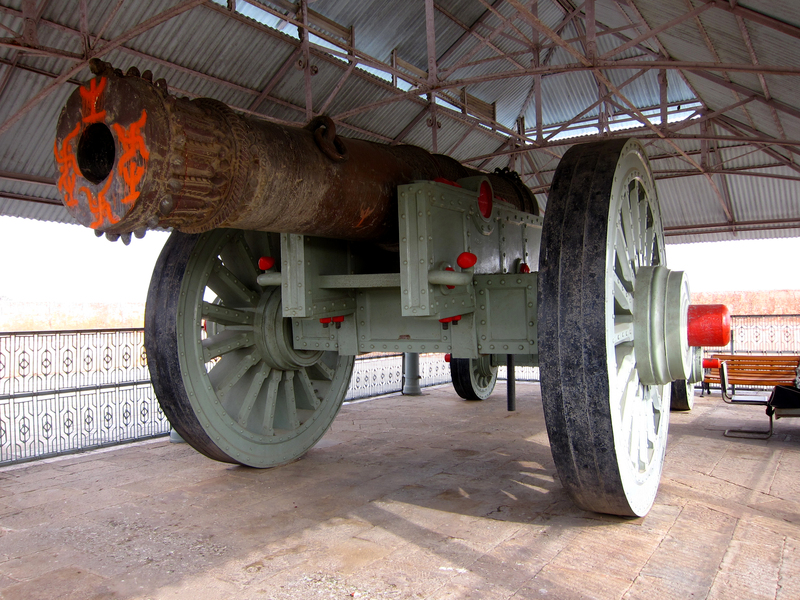 Situated on the highest point in Jaigarh Fort is Jai Van, the largest cannon on wheels in the world. 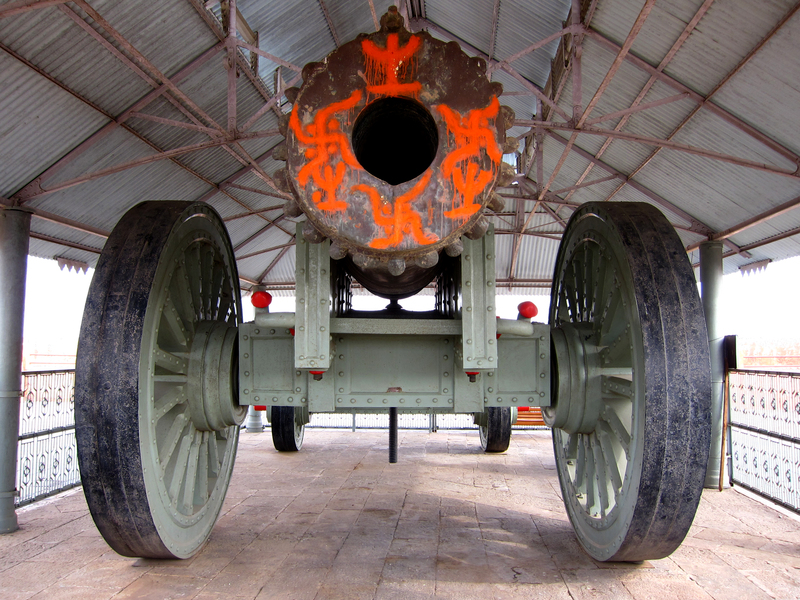 Weighing in at 50 tons and with a barrel length of just more than 20 ft, Jai Van could use 220 lbs of gun powder to launch a massive cannonball over 22 miles. Impressive distance, but I am skeptical of the accuracy. 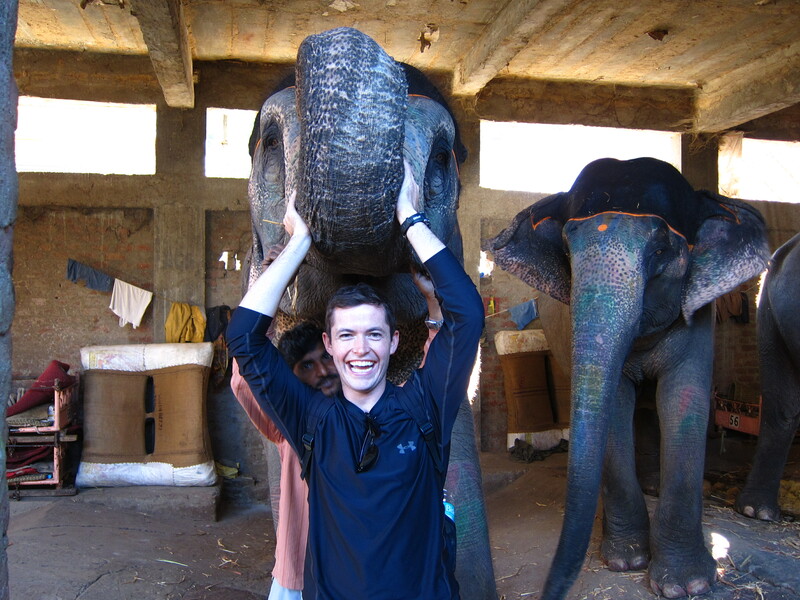 Four elephants were required to move it into firing position. The Maharajas used elephants to move up and down the steep paths as well as power to move supplies and military equipment. 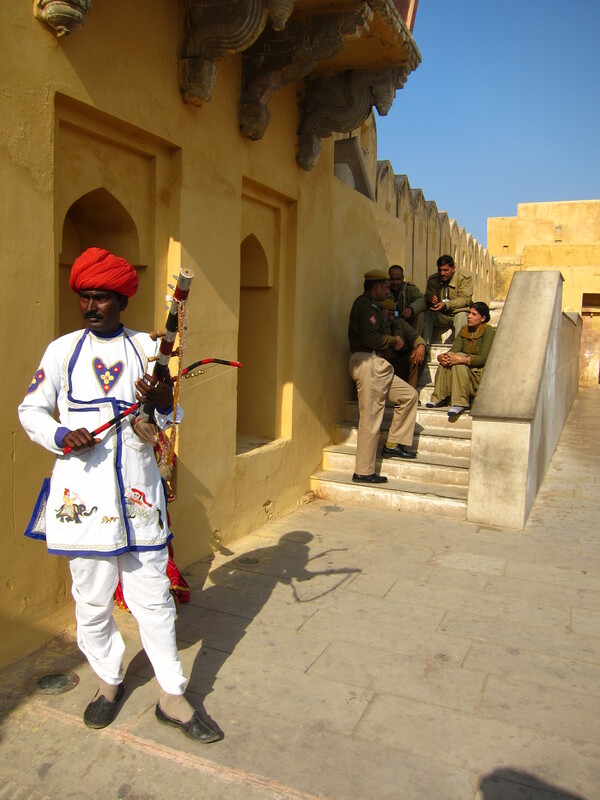 Elephants are still the luxurious way to enter the fort. 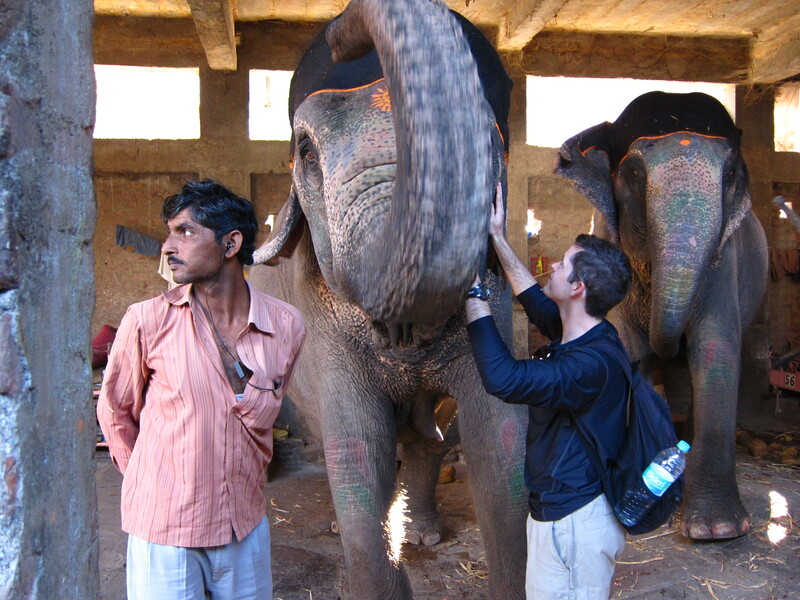 However, each elephant is only allowed five trips up to the fort each day before it is taken home, fed, and given rest. 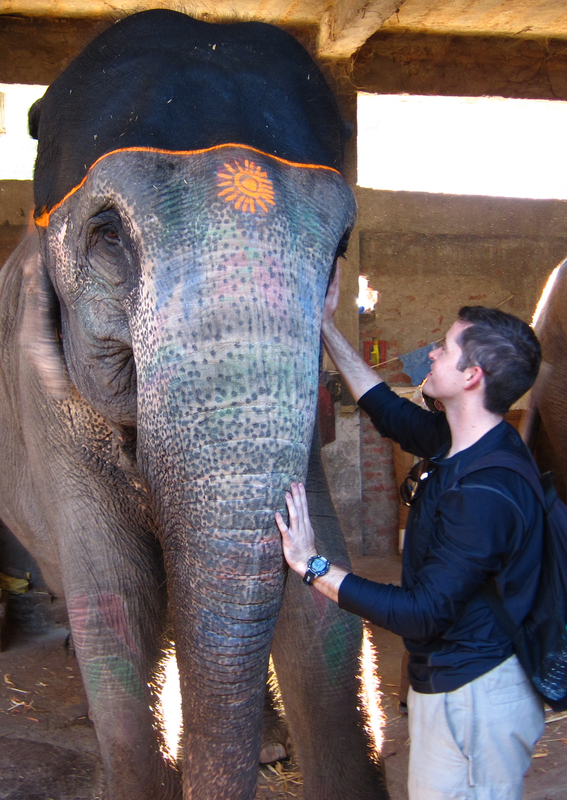 The elephants are also rested in the middle of the day when the sun is highest in the sky. Although we did not get the chance to ride to the top, our tour guide took us to one of the ‘stables,’ for lack of a better word, where we were able to play with the elephants. Their skin is tough and hair like cactus needles, albeit not as sharp or hard. Their eyes can almost talk. This elephant was eating as I stood under his trunk, which contributed to my laughter. Standing so close to a chewing mouth that looked like it could take my head off in one bite felt a bit strange. 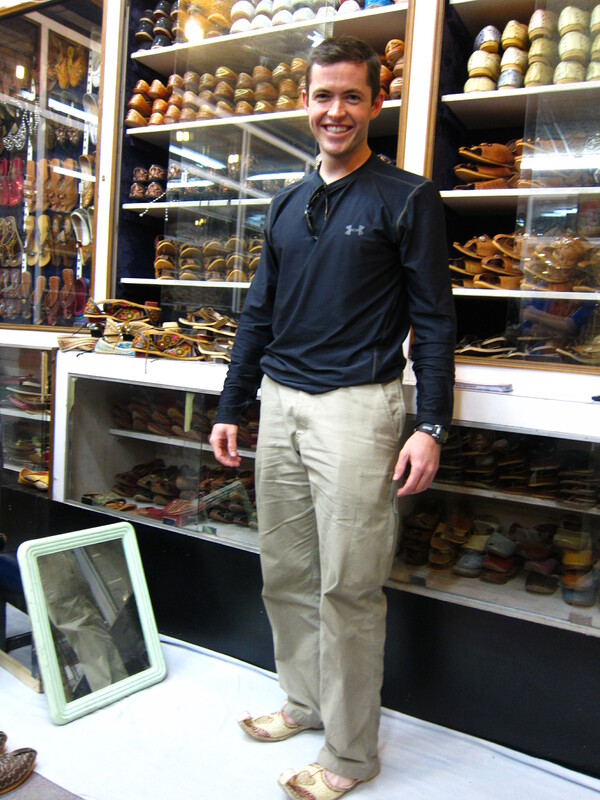 We also did some shopping in Amer at a huge fixed-price store that I actually enjoyed shopping at. 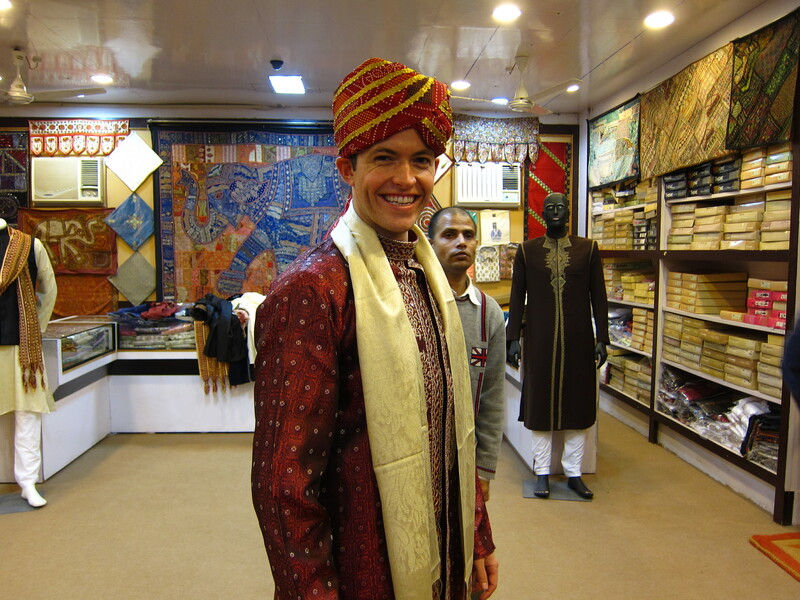 In preparation for the wedding this weekend, I bought this hand-embroidered kurta pajama, silk scarf, and pair of camel-skin jooties with the curly pointed toes straight out of Aladdin. This entry was posted in Tourism by John. Bookmark the permalink. What a history lesson you are giving us alongside the fantastic photos! 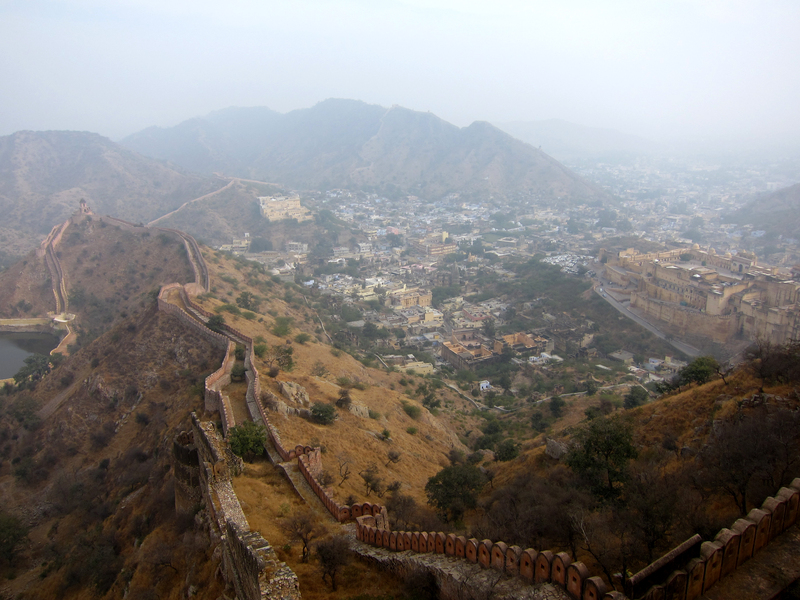 How I would like to see that Amber Fort . It is magnificent as is the surrounding wall. I doubt I would stand under that elephant’s trunk while chewing. 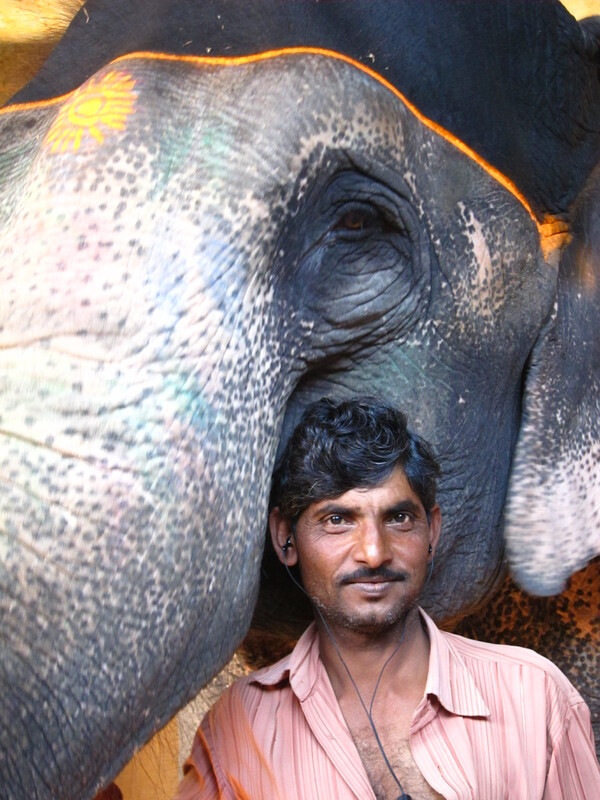 I especially liked the closeup photo of the eyes of the guide and the elephant. Also, I am glad you found time to do some shopping! You look maaaaavelous Aladdin!